A jury convicted a Los Angeles man on Thursday of attacking, threatening and kidnapping his ex-girlfriend in Duarte in May, authorities said. The Alhambra jury found Albert Casillas, 38, guilty of kidnapping, domestic violence and making criminal threats following a four-day trial, Los Angeles County District Attorney’s Office spokesman Ricardo Santiago said in a written statement. He faces up to 24 years and four months in state prison when he returns to the Alhambra branch of Los Angeles County Superior Court on Sept. 28. The series of crimes took place on May 3. Casillas went to his ex-girlfriend’s Duarte home and, while in front of the woman’s residence, forced her into his vehicle and threatened to hurt her if she got out,” Santiago said. Casillas then drove the victim from the kidnapping scene at Millbrae and Central avenues to his home in East Los Angeles. A witness reported the abduction, and deputies arrived to find the woman suffering from injuries to her body, Los Angeles County sheriff’s Lt. John McClure said at the time. The woman told deputies she had not been the victim of any crimes, but deputies arrested Casillas based on her injuries and the accounts of witnesses, McClure said. The jury convicted Casillas of all three crimes with which he was charged. AZUSA >> A woman escaped from three masked kidnappers who forced her into a minivan as she stood on a sidewalk in Azusa early Sunday morning, officials said. The crime took place about 2:45 a.m. as a 34-year-old woman was standing on a sidewalk while waiting for a ride in the 200 block of East First Street, Azusa police official said in a written statement. The woman hopped out of the still-moving minivan, which sped away. The driver and two passengers of the van were initially described only as three men with their faces covered., Sgt. Jorge Sandoval said. Their vehicle was described as a black minivan, similar in appearance to a Nissan Quest. No weapon was seen, and no serious injuries were reported, according to the sergeant. Anyone with information is urged to contact Azusa police at 626-812-3200. Tips may also be submitted anonymously online to L.A. Regional Crime Stoppers at 800-222-8477. PASADENA >> Police have released a composite sketch of a man who tried to kidnap a woman from a Pasadena street before being scared away by a good Samaritan last weekend, authorities said. The attempted abduction took place just after 8 p.m. along Maple Street, just west of Fair Oaks Avenue, Pasadena police officials said. The woman, who was in her late-teens, suffered minor injuries to her elbows and knees from being dragged by the would-be kidnapper, but was not seriously hurt, Pasadena police Lt. William Grisafe said at the time. She was walking down the street when she noticed a man standing on the sidewalk ne to the opened passenger-side door of a white pickup truck, Pasadena police said in a written statement. A passing motorist noticed the struggle and came to a stop, officials said. “This action by the witness caught the attention of the suspect, who then released the victim,” the statement said. The attacker got into the driver-side of the pickup truck and was last seen driving West on Maple Street, then entering the 134 Freeway. Officers searched the area for the suspect, as well as witnesses, officials said. He remained at-large Friday. Police described him as a Latino man in his 20s, with a light complexion, of thin build, clean-shaven, with light brown hair. He drove a white, late-1990s- or early-2000s-model pickup truck, possibly a Dodge Ram with an extended cab. It was missing its front bumper. PASADENA >> A young woman escaped a would-be kidnapped who tried to drag her into his pickup truck in Pasadena on Saturday night with the help of some good Samaritans who intervened in the attack, officials said. The attempted abduction unfolded about 8:15 p.m. as a woman in her late-teens was walking on the sidewalk in the 400 block of North Fair Oaks Avenue, just north of the 210 Freeway, Pasadena police Lt. William Grisafe said. A white, late-2000s-model Dodge Ram pickup truck pulled up beside the woman, according to Grisafe. “The occupant exited the truck, grabbed her from behind and attempted to drag her into the truck,” he said. The woman screamed for help, drawing the attention of several nearby witnesses. As the good Samaritans rushed to the woman’s aid, the attacker released her, returned to his truck and sped away, the lieutenant said. Grisafe said the woman suffered minor injuries to her knees and elbows as a result of being dragged by the failed kidnapper. Police described the attacker as a Latino man in his early 20s, with a light complexion, about 5 feet 7 inches tall and of thin build. He was last seen driving west along Maple Street before getting onto the westbound 210 Freeway. DUARTE >> An East Los Angeles man accused of kidnapping, assaulting and threatening his ex-girlfriend in Duarte earlier this week denied criminal charges on Friday, authorities said. Alberto Casillas, 37, of East Los Angeles is accused of kidnapping, domestic violence and making criminal threats, according to Los Angeles County District Attorney’s Office spokeswoman Sarah Ardalani. He pleaded not guilty to the charges during his arraignment hearing on Friday afternoon in the Alhambra branch of Los Angeles County Superior Court. “The felony complaint also alleges that the defendant was previously convicted of making criminal threats in 2010,” Ardalani said in a written statement. The defendant showed up at the home of his ex-girlfriend in the area of Millbrae and Central avenues in Duarte about 1:45 p.m. on Wednesday, prosecutors and Los Angeles County sheriff’s officials said. “While in front of the woman’s residence, the defendant allegedly forced the ex-girlfriend into his vehicle and threatened to hurt her if she got out,” Ardalani said. “Casillas then reportedly drove the pair to his East Los Angeles home, the prosecutor added. A witness to the alleged abduction contacted law enforcement about the attack,” she said. Deputies found both Casillas and his alleged victim at the suspect’s home on Ferguson Drive in East Los Angeles, on the border between Commerce and East Los Angeles, sheriff’s Lt. John McClure said. “When officers arrived at the defendant’s home, they allegedly found the victim in the driveway with injuries to her body,” Ardalani said. Casillas was arrested without a struggle. Casillas is scheduled to return to court May 17 for a preliminary hearing, court officials said. He was initially held in lieu of $100,000 bail pending his initial court appearance, county booking records show. But the court granted a request from the prosecution that bail be increased to $250,000, Ardalani said. If convicted of all charges, Casillas faces up to 24 years in state prison. 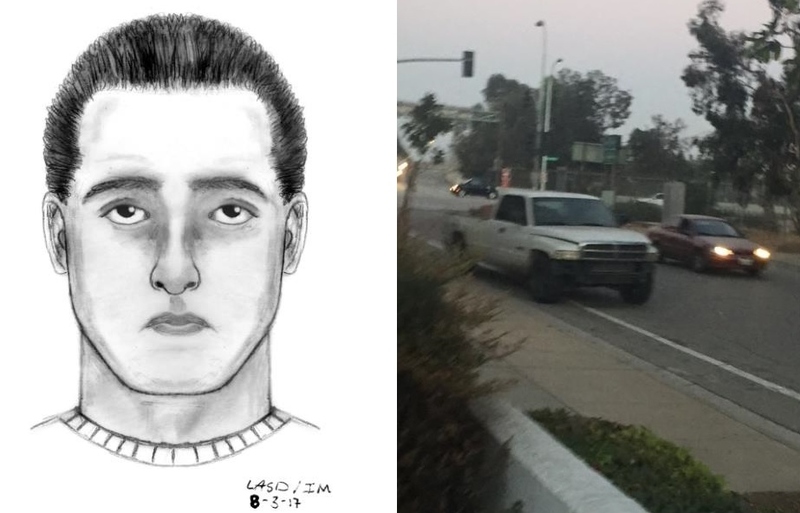 DUARTE >> Detectives are seeking a man who tried to kidnap a woman as she was jogging in Duarte over the weekend, authorities said. The woman managed to fight off her attacker and escape following the assault, which took place about 7:30 a.m. on Sunday along a running trail near Royal Oaks Drive and Oak Avenue, Los Angeles County sheriff’s officials said. A woman in her mid-50s, was jogging on the trail, as she often does, when the would-be kidnapper approached and suddenly grabbed her, Lt. Tom McNeil said. She managed to fight off the man as he began to drag her away, he said. The victim suffered minor injuries but declined to be taken to a hospital for treatment. The suspect was last seen driving off in a tan, four-door sedan, sheriff’s officials said in a written statement. He was described as about 5 feet 6 inches tall, 160 pounds, wearing all-black clothing. No weapons were seen during the incident. Anyone with information is asked to contact Detective N. Brenes of the sheriff’s Temple Station at 626-292-3309, or via email at nbbrenes@lasd.org. Tips may also be submitted anonymously to L.A. Regional Crime Stoppers at 800-222-8477.